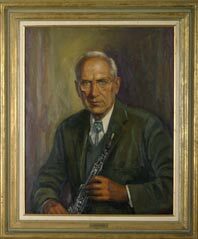 Robert Sprenkle (1914-1988), principal oboist of the Rochester Philharmonic Orchestra for 48 years and professor emeritus of oboe at the Eastman School of Music, received his bachelor’s degree from Eastman in 1936. Professor of oboe for 45 years, Mr. Sprenkle was known internationally as a superb performer and teacher. In 1974 he was named “Musician of the Year” by the Rochester chapter of Mu Phi Epsilon. Mr. Sprenkle recorded for the RCA, Columbia, and Mercury labels. His book The Art of Oboe Playing was recognized as the standard work on his instrument.